Is that a zitt?. Clopin thinks there's a zitt on Esmeralda's nose.. Wallpaper and background images in the Clopin Trouillefou club tagged: clopin trouillefou the hunchback of notre dame. 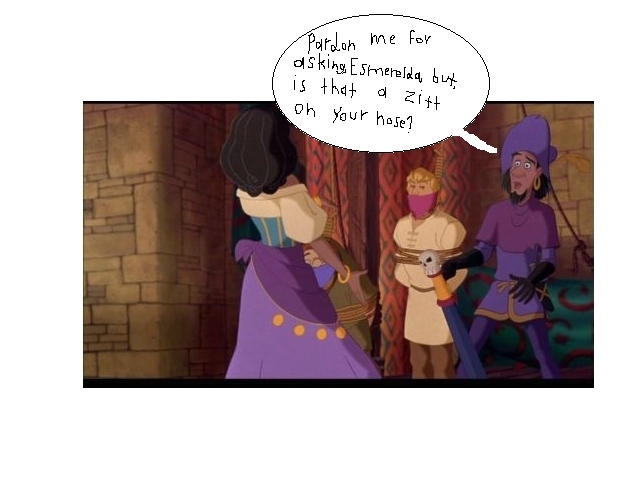 Clopin thinks there's a zitt on Esmeralda's nose. This Clopin Trouillefou photo might contain tanda, poster, teks, papan tulis, koran, kertas, majalah, tabloid, kain, rag, anime, komik, manga, and kartun.